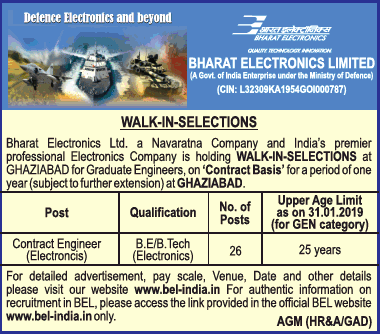 Bharat Electronics Limited, a Navaratna company and India’s premier professional electronics company is holding walk-in-selections at Ghaziabad for graduate engineers on contract basis for a period of one year (subject to further extension) at Ghaziabad. However, the candidates must come prepared to stay in Ghaziabad for 1-2 days. of management in this regard would be final. Click here for official notification or visit the official website and go to the careers section.